In last month's survey of Oregon City High School students, 78.4 percent feel that bullying occurs the most on social media, rather than in hallways or other physical areas of the school. The survey was written by local organization Continue to Find Kindness, whose mission is to bring together local students, teachers and parents to help combat bullying. "Kids teaching kids" is the main method for CTFK in giving students ways to tackle mean behavior. Social media has contributed to the rise of bullying, CTFK members said, and kids today are getting smarter in hiding their social media applications so that their parents don't know what they're using. 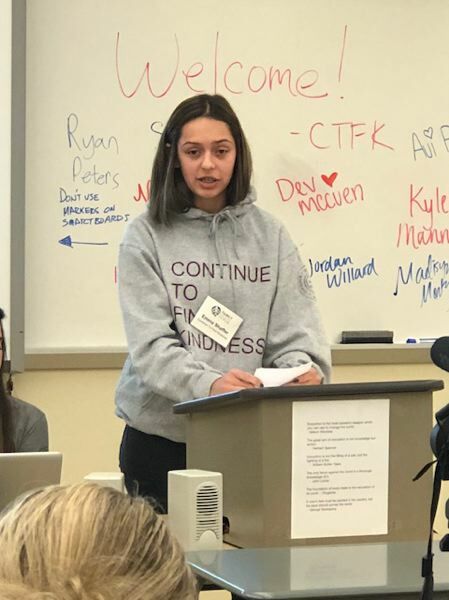 "The good news from the survey is that we found as students got older, the reports of bullying diminish," said OCHS senior Madisyn Montgomery, CTFK founder and president. More than 100 students took the survey, and 77 of the anonymous survey respondents identified as having been bullied; 32.5 percent of the bullied students said they experienced bullying in ninth or 10th grades. Bullying was much more likely before high school, when 72.7 percent of OCHS students experienced the bullying. The results weren't particularly surprising to CTFK members, who have stepped up their efforts to reach out to middle schoolers. "I've definitely become more aware of it since I became involved with CTFK," said Jordan Willard, OCHS senior and CTFK secretary/treasurer. CTFK recently spoke to over 800 students at Gardiner Middle School. On Feb. 15, CTFK will present at Ogden Middle School, the other middle school serving the Oregon City School District. CTFK might be unique in the metro area in getting youth leaders to volunteer their time to prevent bullying. Throughout its history, starting in 2012, the organization has reached more than 3,000 students. CTFK was registered as a trademark in 2016 and currently is seeking federal nonprofit 501(c)(3) status. Emma Shafer, a freshman at OCHS and a CTFK board member, was surprised that more kids who are bullied don't confide in their parents. Only 24.5 percent of OCHS survey respondents said they would be most likely to confide bullying behavior in parents, with most (64.2 percent) saying they'd be more likely to confide in peers. Shafer recommended that parents begin habits of asking their kids about their day at school from a young age. "It's very good to start from the beginning with your kids talking with them about their day, because then it's normal," she said. A father whose daughter was bullied starting in elementary school recently spoke to CTFK members as part of a public presentation at OCHS. His daughter was severely bullied in eighth grade and decided not to go to Milwaukie High School so she could focus on recovering from bulimia. The family's life was turned upside-down because the mom had to quit her job in order to qualify for state-supported private schooling. After her family moved out of Milwaukie, the daughter is recovering from the eating disorder and going to a high school elsewhere. He said that his daughter was bullied into bulimia, and the resulting lack of nutrition forced her for a time in a wheelchair. "That is a perspective that a lot of people don't acknowledge, and it was really moving to witness a father talking about the effect of his daughter being bullied," Montgomery said. "This is one of the many stories we've heard of people trying to change who they are to fit other people's image." The father spoke Jan. 27 at OCHS's free Family Focus Forum Parenting Event, where CTFK gave a presentation. Willard introduced the father to highlight CTFK's "courage" part of the presentation. Also during the presentation, Shafer talked about how being unkind can affect a student's ability to get accepted into colleges that are looking at applicants' social media profiles. "It follows you around and can be on your résumé through colleges or jobs looking on your social media," Willard said. Montgomery, who just finished her term as president of the Oregon Association of Student Councils, volunteers every Friday at the Youth Line, a crisis line for teenagers. 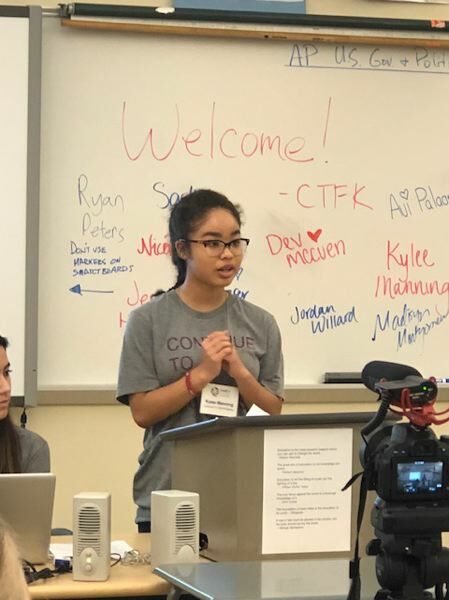 Among the CTFK members who have been recognized for their work, she was named Oregon City's Amazing Kid in 2014 as part of Pamplin Media Group's annual recognition of students across the region who are making a difference in their communities. Shayla Montgomery, an active volunteer with CTFK (no relation to Madisyn Montgomery), recently was named a Prudential Spirit of Community Award finalist for her "outstanding acts of volunteerism." 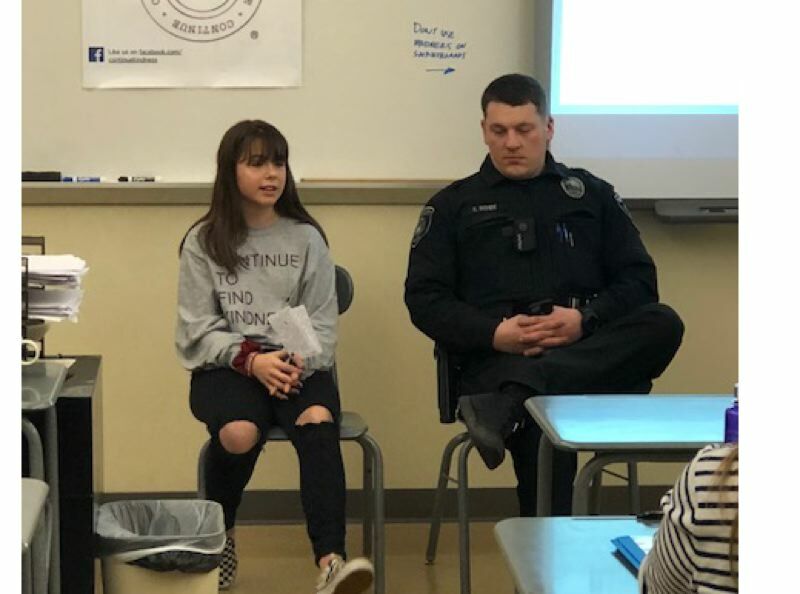 The sophomore at Clackamas Middle College has reached thousands of people with messages about recognizing and resolving bullying with "#STANDUP," an awareness-raising campaign inspired by her own experience being bullied. She has been featured in this newspaper previously for this work that helped earn her titles as National American Miss Pre-Teen in 2015 and National American Miss Oregon Junior Teen in 2017. More information about CTFK and video clips can be found at continuetofindkindness.org.